Why are there no phones? No cell coverage? There are no cell towers in the middle of the desert. I had decent service, though once 70k people show up the towers get overloaded. I could make calls but had zero data connection. I recall an article, probably here, of some hackers who set up a mobile service of their own at BM. Coping with overloading was a problem. They kindly had a link back to the real world, so people could make phone calls outside the BM area. Free of charge, too. Even a BM-only phone network would seem useful to set up. Would definitely get some hacker-respect. +1 for not simply assigning the string ‘middle of nowhere’ to a variable. MOD EDIT: you can use basic HTML in these comments, people. Also, dust. Dust everywhere. You need to remove ‘.jpg’ from the link in order for it to work. Also, no. Just no. 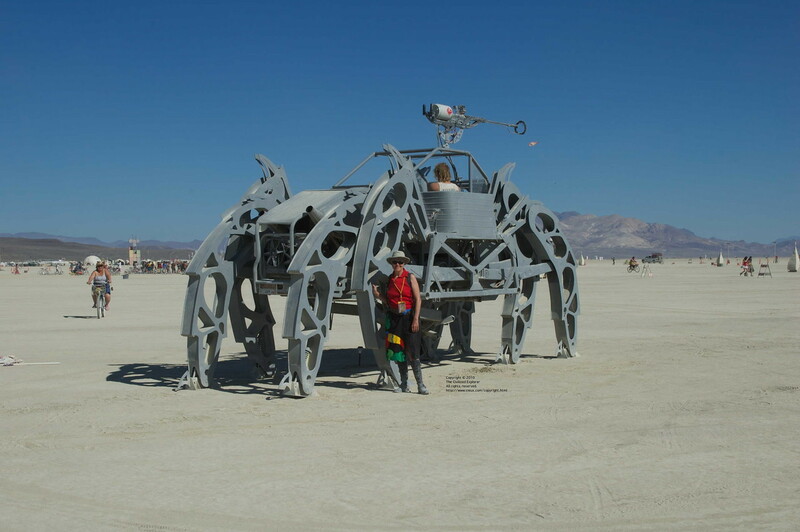 Sorry, still the best sexperiment at Burning Man though. Nice. Requisite bucket of bleach not pictured. A few years ago you needed satellite phones to communicate with the default world. About 4 years ago, cell came to Black Rock. This year w has interweb and all that. (At least on Verizon. 4 bars at Black Rock!). No harm. Enjoyed postings. Does H.A.D have some sort of commercial relationship with Burning Man? I see loads of projects that include burning man as the inspiration of a hack. Or is it just a big in Cali? Over here where I live in Scotland we have The Wickerman festival about 5 miles from me, Same sort of idea. The burning man festival was capped at 70,000 this year, and usually sells out. It’ has spawned dozens of smaller burns across the globe – by now there’s probably at least one in every US state each year. The general theme is to participate, so everyone is supposed to do something that contributes to the other goers. This means tons and tons of interesting art, performance, and technology. I’ve personally seen a 40-foot robot that breaths fire, another that picks up and crushes cars, and a full-sized oil derrick catch fire and burn. The number of hacks and interesting technologies cannot be overstated – there are literally hundreds of interesting configurations of gadgets, lighting, sound, art, and other experiences. To take a personal example, last year I happened to pass by a 6′ sphere with an internal projector showing the globe on the surface of the sphere, and other moving, animated images. …completely seamless. I could find no distortion and no evidence of stitching anywhere around the globe or over the top. (It was on a pedestal base.) I asked the owner and he said it was one of only 2 in existence (at the time), and they were the only company to have accomplished that particular goal, and that it was an incredible engineering feat to pull it off. Wickerman appears to be a music festival, where people go to hear big name artists perform. Burning man is an art festival (not just music), and people go to see the participants perform. I’m not dismissing the excellent Wickerman festival, but the theme and intent is completely different. Sounds cool, I would much prefer burning man closer to me by the sounds of it. Thanks for explaining it all to me.